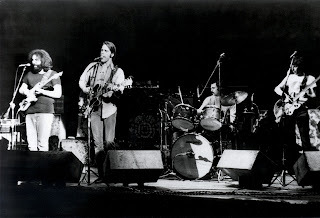 Winter 1971 Grateful Dead. Keith Godchaux joined the band in mid October, and the band was energized with this new addition of talent. 11/7/71 smokes from bell to bell. The band is in great spirits, chatting it up to the crowd (both in the hall and on the radio), despite technical difficulties a-plenty. Set one opens with a blistering Truckin’ and it never looks back. Everything is just a little better than usual, and everywhere you look (listen) there is something wonderful going on. Take a close listen to Jerry’s background vocals, of all things, on Beat It On Down The Line. He is just loving the song. “Coal mine, coal mine, coal mine.” It’s just awesome. Jerry gives each “coal mine” its own special color, and something so minor elevates the song to the “you don’t want to miss this” level. This is the sort of thing that makes me love Jerry all the more. More of the same for the “happy home’s” at the end of the song, after which Jerry then gives off a “Wooo!” and you can’t help but be drawn into the great energy of the first set. Jerry’s leads throughout the show are great, and Billy Kreutzmann’s drumming makes you realize that he is without a doubt one of the most unsung rock drummers of all time. He is the glue that holds the whole thing together, and the core force that creates all this great energy within the band. There are many tunes that would still qualify as “new.” “Brown-Eyed Women,” “Jack Straw,” “Tennessee Jed,” “Comes A Time” (with an extra verse), “Ramble On Rose,” “Mexicali Blues,” “One More Saturday Night” – most of these debuted less than three weeks earlier, and every one of them is delivered as an absolute gem on 11/7/71. The late second set “Playin’ In The Band” is already starting to stretch out with a nice jam-interlude section on its way to its ultimate form in 1972. And, we even get one of only two versions of “Hideaway.” The other would come in 1989. Then there’s that Dark Star> Drums> Other One> Me & My Uncle> Other One in the second set. Whew! The Dark Star is very spacey, in a gentle, “leave me here to wander around blissfully for a few years” sort of way. So nice. After a nice tight drum solo, the Other One explodes. This version is noteworthy for the way it quickly transitions from thunderstorm-like power to glistening dew-like quiet again and again. The quiet passages feel a lot like the Dark Star, and thus manage to swirl the brain all the more. Adding to this is the perfect slip into Me & My Uncle. You want a monstrously psychedelic explosive Me & My Uncle? This is it. It would be even more noteworthy if it wasn’t for the fact that late 1971 was the season of the Other One/Cowboy Song/Other One sandwiches. This one finds the intense interplay of the second set infusing the simple nature of the song – the Other One plays the Me & My Uncle here. It tears through as if it never saw what was coming. Fantastic. The second set goes on and on with great music. The NFA>GDTRFB>NFA is one for the ages. The combination of great huge jams and equally great single songs makes this show worth listening to from start to finish many times over. A historically hard show to find in excellent quality, this pre-FM master made it into circulation some years ago. Truly a treasure. Great review+show, I hadn't given this one a thorough listen. Awesome photos, too! I haven't seen many of these. 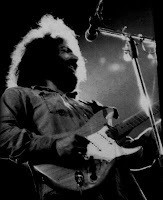 The red '71 shot is great - Winterland in May, I wonder? On other sites fans rate this as THE best Dead show. I first listened to it a couple of a weeks ago and was a bit disappointed. There are so many technical difficulties that it's hard to find a nice rhythm. Just a lot of long breaks between each song. While the energy of each song is unbelievable, I found the keyboards to be somewhat odd. It sounds like an amateur going "clink, clink, clink." The sound is definitely great for the time period, but not one of my favs. I wore out this show on cassette. Thankfully this was the first show I downloaded digitally. It's one of my top 5 favorites. We're dying for a new post. Please, please, pretty please! Do you plan on reviewing more shows?